Over the past 10 years, three wars waged on the Gaza Strip have had devastating effects on the population of 2 million in both large and small ways. Since the first war in 2008/09, says Hedaya Abu Lehia, a technician assistant at the El-Amal Audiology Clinic, Gaza has seen a 30 percent increase in hearing impairment. The reason, she reports, is the exposure to loud explosions. Yamen Abu Jame’, 10, lost hearing in one of his years in the 2014 offensive on Gaza. He and his family live in eastern Khan Younis, where Israeli tanks invaded. “My hearing ability was perfect when I was younger, but I started to notice I couldn’t hear my teachers well in the classroom after the war,” he says. Since deafness can gradually erode the ability to speak as well, Yamen parents worked with El-Amal to fit him with a hearing aid. Alaa Zaqout, 13, was diagnosed with hearing impairment after the 2008-09 war, but in both ears. Hearing impairments also are caused by genetics, aging, infection and birth defects. However, due to the deteriorating economy in the Gaza Strip, few residents can afford hearing aids, which range in cost from $400 to $1,000. That’s where El-Amal comes in. The El-Amal Rehabilitation Society is a nonprofit NGO that was established in 1991 in Rafah after a field survey found a large number of deaf people living in the southernmost part of the Gaza Strip without access to needed services. It runs an audiology clinic to assess degrees of hearing impairment, a speech therapy program to preserve the ability to speak coherently among those who are not completely deaf, a kindergarten and school for deaf children up to age 15, an activity center called the al-Anabel Club that integrates deaf children with those who have normal hearing and an adult education center for all that teaches sewing/embroidery, cooking, woodworking/carpentry and cosmetology to everyone in the neighborhood. However, education isn’t enough if the hearing-impaired cannot obtain jobs or are otherwise discriminated against. Thus, El-Amal plays an advocacy role as well. As in any other area in the world, the inability to communicate with others can ostracize the deaf and result in poor social adjustment and lack of self-confidence. For example, Alaa’s mother tried to hide her daughter’s hearing aid within the girl’s hair and told her to start wearing a hijab at the age of 10 (instead of the usual 12 or older). “Although I warned of the consequences of her decision, one of the mothers even refused to get her son a hearing aid so others won’t make fun of him,” says Abu Lehia. Nonetheless, with El-Amal’s help, many people with hearing impairments successfully step out of the shadows. 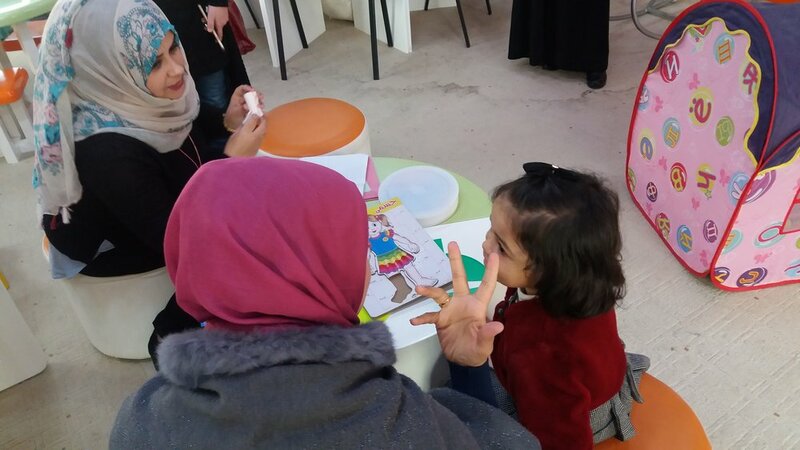 For example, Sanaa Hashem, now in her 30s, enrolled in the El-Amal school for the deaf when she was a child, and upon graduation, she became a teacher there. The school began with 15 students and later expanded to 183. Recognizing the many practical difficulties facing all Gazans who try to study, embroider and do other tasks at home, El-Amal partners with Rebuilding Alliance, an international nonprofit that donates solar lights to fill the gap when electricity shuts off for 20 or more hours at time. “After distributing these donations, which we call Nur al-Amal (light of hope), our children started to use them to light the road when they walked to school in the dark mornings,” says Dalal Qanan, the society’s public relations and media officer. The partnership is critical, since a severe shortage of funding has meant the staff of El-Amal has not received their salaries for the past eight months. “But we can’t stop working, even when there is no money for salaries,” says Mosab Au Daqqa, director of the adult education center. “We belong to this place and these people. We work with love."